As much as I like to think that when I wash the dishes, they will stay washed, it just isn’t so. A surprisingly large portion of our “tasks” are actually things that need to be done over and over. Rather than putting “wash the dishes” on a to do list, this type of activity needs to become part of a routine. Routines are the powerhouse of your household systems. Let’s take a closer look at some of the routines that need to happen around the home. Some things, like dishes, are ongoing. They need to be done every day, at least once, and sometimes multiple times a day. People expect to eat every day. They use dishes every day. The mail (electronic and paper) comes every day. Every day, people in the house get things out and use them, and sometimes (usually) forget to put them away. The bed gets slept in, clothes are worn, bathroom sinks get used—every day! If you don’t have a plan to deal with these things in a daily, routine way, dirty things will pile up very quickly. It’s usually this daily living mess that quickly overwhelms you and makes you think your house is a wreck. Some things only happen every few days or once a week. The garbage gets collected weekly. Laundry day is Friday and grocery shopping is on Saturday. Once a week the gerbil cage gets cleaned out (usually), books go back to the library, houseplants get watered, vacuuming and dusting happens, and leftovers are cleaned from the fridge. These kinds of things are less of a crisis on a daily basis, but they tend to become critical if they get neglected. Plants and animals don’t thrive when you neglect them. Library books accumulate fines. The house starts to get dirty and downright unsanitary if you neglect it for more than a week or two. Most of the things on the weekly list tend to be important, but not urgent. Then there are the things that are done about once a month. These include things like paying bills, cleaning heater/AC filters, wiping down walls (where people trail their hands), wiping out the refrigerator. The biggest problem with these kinds of things is that they don’t happen frequently enough to really be on your radar. The other problem is that some of these are critical, like paying your bills on time, and come with a steep penalty when you don’t do them! Other things are non-critical, but if you never do them, that part of your house can become inefficient (clogged filters) or they get really horrible after a while (hello, refrigerator!). Lists of once-a-month chores can seem overwhelming. But I think this is mostly because for some reason when we see a whole list, we think it all has to be done right away. Not so! Things that need to happen once a month don’t all have to be done on the same day (and probably shouldn’t be). This is exactly why you need a system, so that you can transfer this monthly list onto the daily/weekly list of things you do. One week you pay the bills, another you wipe down walls and clean out the refrigerator. Having a system allows you to spread these things out over the course of a month, so they get done, but don’t overwhelm you. Finally, there are those things that only happen seasonally or annually. Things in this category include paying annual bills (like insurance), gardening, getting the car inspected, swapping seasonal clothing, and holiday decorating. Many of these activities depend on where you live and whether you have your own home or a garden. This kind of stuff is really hard, because it just doesn’t happen often enough to remember (sorry, Officer—didn’t realize the inspection sticker was expired). Some of it is important, but doesn’t have a deadline, like deep-cleaning your house. Some of it does involve looming deadlines (holidays come to mind), but exactly how you go about it is flexible. The point is, if you have a system, you get these things on your calendar so you don’t miss deadlines or get into a holiday crisis. Many of the things that happen annually need to have a sub-system of there own. A sub-system can help you tackle big projects so you don’t get overwhelmed or just put it off indefinitely. Think about holidays or vacations. These are big projects that have a lot of moving parts. You need to have some sort of “template” that you can repeat from year to year. So where do you start? I suggest you sit down and brainstorm things that happen in these different time frames. I made a list on my computer starting with all the daily things I could think of (food, cleaning). Then I moved on to weekly and monthly (cleaning, bills). Then I listed each thing I could think of by season (Spring, Summer, Fall, Winter) and then what happened annually (holidays, birthdays, vacation, etc.). List them all out so you aren’t just winging it! 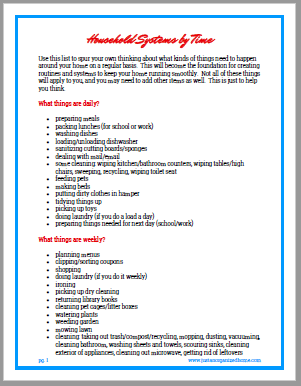 If you’d like some help thinking of things that might belong on your list, you can download a free printable list Household Systems by Time. Remember, the list is just to stir your own thinking—not everything will apply to you. Please don’t get overwhelmed by this list and think you can never do it! If you feel overwhelmed by it (or worse, you feel like a failure), you probably just need help getting a system set up so these things will happen on a regular basis. We’ll talk in another post about how to start creating some of these systems.